Nashville, Indiana is a small town in the hills of Brown County. It's home to many artists, musicians and craftspeople with around 200 unique specialty shops. There was always a music store in Nashville, Mountain Made Music. They specialized in folk and bluegrass music and instruments. When the word got around that Mountain Made Music was going out of business in 2006, Kara realized that someone had to step up to keep music alive in Nashville. Kara went in with local luthier Jeff Russell and rented an empty storefront on the east side of the courthouse. 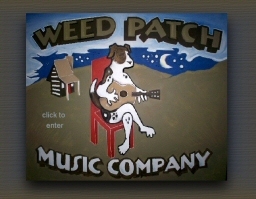 The Weed Patch Music Company was born. Looking for something in particular? There is a site index available. ©2009 and later by Kara Barnard. All Rights Reserved. Questions or comments about this site? Click here to contact the webmaster.